Clay Warburton’s class plants trees along Whychus Creek. 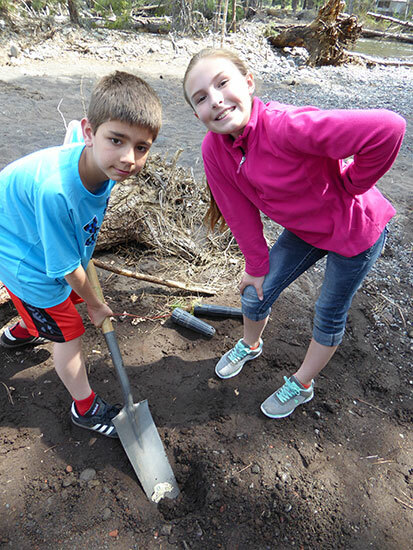 Across the Sisters School District this year, students learned the concept of stewardship by participating in a variety of projects that helped them build connections with both the community and the environment. Many classes participated in hatching and releasing baby salmon into Whychus Creek and performed riparian restoration along the creek’s banks. Through the Sparrow Club, the school “adopted” a fellow Sisters Elementary student in need of on-going medical treatment. Students performed community service work, which the club then turned into “money” earned to help with the family’s expenses. To bring the concept of stewardship alive for his fourth graders, teacher Clay Warburton used “service” as a framework for class projects and experiential learning throughout the school year. “We had awesome service-learning connections with the Upper Deschutes Watershed Council and through the Sparrow program,” Warburton said. Other service work performed by Warburton’s class included cleaning the school and painting windows at Christmas time.